An environmental officer from Popondetta is the third winner in the Digicel “Top Up & Win Mega Cash” promotion. Ishmael Koneha’s phone number was one of 10 drawn live on TVWAN on Monday night. He answered his phone when Digicel rang him, winning a life-changing K100,000. Ishmael is a regular prepaid customer who purchases his flex cards from two of Digicel’s retail outlets in Popondetta. The money will no doubt make a big difference to Ishmael who works in the area of endangered forests and butterfly conservation, including the protection of the endangered world’s largest butterfly the Queen Alexandra’s Birdwing. Ishmael and his wife are very thankful for the major prize and their family are very happy. Ishmael said “we are still in a state of shock over the win and it’s slowly becoming a reality”. Ishmael said his four children’s school fees are now going to be paid and he also plans to continue the completion of his trade store business in his village in Kokoda. The remainder of his prize money he plans to save for his family’s future use. Held every Monday evening at 5:35pm until February 15, the competition is open to Digicel customers who purchase either a K3.30 or K5.50 Flex Card, or who Top Up with K3.30 or more using electronic top-up machines. This week, Digicel customers who purchase either a K3.30 or K5.50 Flex Card, or who Top Up with K3.30 or more using electronic top-up machines, will receive double entries into the draw. Digicel is saying Happy Valentine’s Day to all its customers by giving them double entries in the final “Top Up & Win Mega Cash” promotion to be drawn next Monday night. 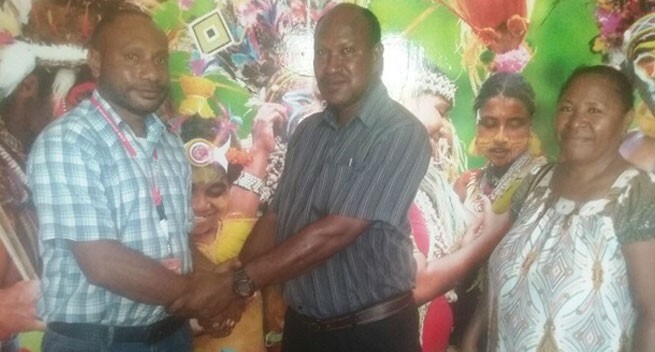 Digicel’s Head of Consumer Khatter Fehmi said the promotion will give everyone a greater chance to win and was Digicel’s way of saying how much it appreciates its PNG customers. Customers have one more chance to win K100,000 with next Monday being the last night of the promotion. It is going to be a very special Valentine’s celebration for one of our customers who will win K100,000,” he said. The Digicel “Top Up & Win Mega Cash” promotion selects 10 random phone numbers, which are called in order until someone answers. The first person called who answers their phone receives K100,000, while a consolation prize of K1,000 is rewarded to the remaining nine people. “Digicel is very pleased to have been in the position to give back to our customers through this promotion,” said Fehmi. To ensure the transparency of the competition, an automated Digicel Random Picker is used to select the 10 numbers under the supervision of a representative of PNG’s Royal Constabulary. Senior Constable Foxtrot Kamin from the Gordons Police Station has witnessed all three live draws and will again witness the final draw. The final live Digicel “Top Up & Win Mega Cash” promotion draw will be held at 5:35pm on Monday 15 February on TVWAN.